Army Sgt. 1st Class Chris Richey knows a lot about battlefield medicine. With three deployments — one to Kosovo and two to Iraq — and more than 400 combat convoy missions under his belt, he’s learned a thing or two about combat casualty care. During his most recent deployment, as part of the troop surge in Iraq from 2007 to 2008, he shared what he’s learned as a military transition team advisor to Iraqi security force medics. So when Richey, a training non-commissioned officer with the Army Reserve’s 399th Combat Support Hospital, arrived here to train Malawian defense forces during Medreach 11, the Malawi soldiers were all ears. “It gave me a lot of credibility,” Richey said as he sat alongside his students preparing for a field training exercise that would put some of the lessons imparted during the past 10 days to the test. Medreach 11 is a U.S. Army Africa-run exercise designed to enhance U.S. and Malawian military medical capabilities and enhance the two militaries’ ability to work together during a humanitarian emergency or other crisis. In addition to humanitarian and civic assistance outreach projects, a major emphasis during the exercise was on training: in the classroom, in training lanes and ultimately, during a field training exercise. The Malawians shared with their American counterparts insights into how they identify and treat tropical diseases and HIV, and were anxious to hear about a variety of U.S. treatment techniques. But what they most wanted to tap into was the wealth of experience the U.S. military has developed over the past decade in providing combat medicine and trauma care. It’s of particular interest now that Malawi has deployed a battalion of about 850 soldiers to support a U.N. peacekeeping mission in the Ivory Coast. The U.S. military has learned many lessons about field medicine during the past 10 years of war, particularly the importance of combat lifesavers who provide that first critical “golden hour” care to wounded troops, Col. Marcus De Oliveira, U.S. Army Africa chief of staff, said. In addition to incorporating these lessons into its own operations, the U.S. military shares them with partners, such as Malawi, that may need to draw on them during peacekeeping or other operations, he said. Brig. Gen. (Dr.) Alfred Chitsa Banda, director of the Malawi Defense Force’s medical service, said he hopes to develop combat lifesaver expertise among his own troops based on the U.S. example. So in support of that request, medical teams from the 399th Combat Support Hospital conducted a variety of instruction during Medreach 11, much of it focusing on combat lifesaver instruction. The 399th instructors applied the “crawl, walk, run” approach to the training, explained Army Sgt. 1st Class Joleen Millette, the 399th’s NCO in charge of plans and operations. Classroom instruction advanced to hands-on practical exercises, as the Malawian medics practiced triaging casualties and moving them — with a litter, if one was available, and if not, using a belt, sling or fellow soldier to help. Lanes training culminated the training, with a litter-carry course set up on an obstacle course at the Kamuzu Barracks complex. The Malawian medics carried casualties through five different stations on the course, taking turns so each soldier got to lead the team. 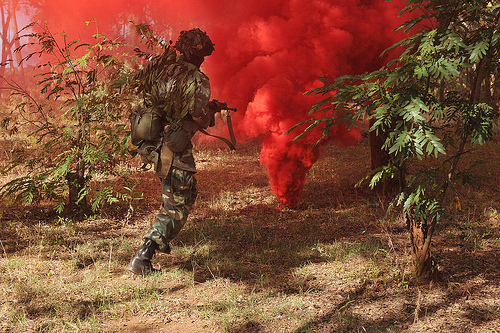 Yesterday’s field-training exercise put the Malawian troops’ skills to the test in a realistic combat scenario. As a convoy advanced down the roadway, the second vehicle was hit by a simulated improvised explosive device, followed by an ambush. The troops quickly dismounted to suppress the ambush, then established security as soldiers exercised their new combat lifesaver skills on the casualties. The “casualties” were moulaged to reflect their wounds. One soldier was “killed” during the attack. One suffered a gunshot wound to the neck, and another had a sucking chest wound. Two had less-threatening injuries: a leg fracture and bruises. With red smoke still choking the ground, litter teams rushed in to triage the wounded and transport them to advanced-level care at a field hospital configured in a tent at the barracks compound. “What you just saw was care under fire,” Army Maj. Jack Twomey, a 399th Combat Support Hospital nurse, told international observers attending the demonstration. It’s a time of quick decision-making for troops on the ground, he explained. A tourniquet applied to stop bleeding or an airway cleared to restore breathing can make the difference between life and death. As the field hospital team went to work on the casualties, Malawi Defense Force Maj. Edward Mandala, the senior clinical officer, reflected on the increased confidence his soldiers showed in applying life-saving skills and moving casualties from the point of injury. In addition to getting a refresher on their basic skills, the 399th classes had introduced them to new ones such as how to operate in a biological environment or conduct a mass casualty evacuation, he said. Richey, who accompanied the Malawian soldiers through the field training exercise, gave their performance a thumbs up. “I love it when good training all comes together,” he said. Citing his own experience, Richey said the training the Malawian soldiers received during Medreach 11 will provide a foundation for them to draw on when and if it’s needed. NCtukX You have brought up a very good details , thanks for the post. proximity to one another. People can be viewed dancing and sharing sweets after completing the religious obligations associated to the telltale festivals.